Based on 2 people sharing a twin room. Transport to & from the airport, hotel & golf courses. Situated in Albufeira on the Algarve, the 4 star Bellavista hotel is close to Albufeira Old Town Square with its bars and restaurants and just a short distance to Aveiros Beach. The hotel is in the perfect location for a golf break in Albufeira and is only around 15 miles from Faro International Airport. Rooms at the Hotel Bellavista are extremely comfortable, light, airy and contemporary. All rooms include free Wi-Fi, Air Conditioning, Satellite TV and hair dryer and offer views to the swimming pool or gardens. There is also room service available from 7 am to 11 pm. The Hotel Bellavista has an excellent range of facilities on offer including four bars and restaurants, two outdoor swimming pools and a heated indoor pool. If you like to have a pamper, we recommend heading to the The Real Spa and Health Club, which offers a Turkish bath, Jacuzzi, sauna, Vichy shower and gymnasium. There are also weekly exercise classes you can take part in including Aquafit and Real Balance. Three rounds of golf are included in this package Pinhal, Laguna, Millennium courses. The Hotel Bellavista is an excellent choice of accommodation and is the perfect for an Albufeira golf break. 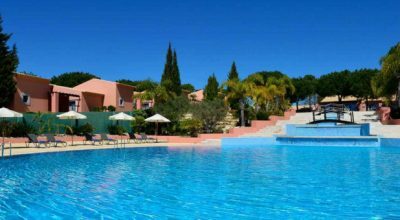 The hotel is perfect for those on a budget looking to play some great golf in the sunny Algarve.